The Cumberland & Dumfriesshire Farmers Mart P.L.C. had forward 2,782 store hoggs & 501 in lamb sheep at their weekly sale at Longtown on Tuesday 9th March 2010. Hoggs were dear and short of requirements. 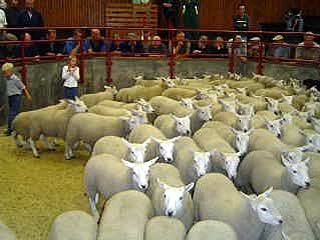 Top was £91.50 for Rouges from Dinwoodie Green, who also sold Texels at £85.50, others to £81.50 Linton House. Suffolks £81.50 Mid Harrietfields, £80.50 Hillview, Oxfords £87.50 Alnwick Farm; North Country Cheviots £82.50 Browtop; Halfbreds £77.50 Adderston Shiels; Kerrys £62.50 Low Northsceugh; Hill Cheviots £69.80 Murtholm; Lleyns £64.50 Broomhillbank; Greyfaces £79.50 Highgreenhill, £78.50 Woodfoot; Blackfaces £72.50 Albierigg; Swaledales £48.50 Albierigg. Cast ewes £110 Linton, Hill types £67.50 Alnham Castlehill. Cast rams £85 Sorbietrees. Inlamb ewes were similar numbers with trade dearer. Top was £124 for Suffolk crosses from Lanton Mill, who also sold Greyfaces at £88; Blackfaces £80 Priorsford, £71 Geltsdale; Swaledales £78 Haithwaite. Inlamb Suffolk ewe hoggs £102 Ysguibor Newynd. Geld hoggs £95 for Texels from Lanton Mill. At the Geltsdale Dispersal of Blackface inlamb ewes, all classes were easy to sell. Top was £71, £69, £68 for ewes scanned twins with singles £66.